Rio de Janerio: Finishing second, third and fourth in their respective sports, Badminton player PV. Sindhu, wrestler Sakshi Malik and Gymnast Dipa Karmarkar etched their names in the history of sports with their superlative performances. 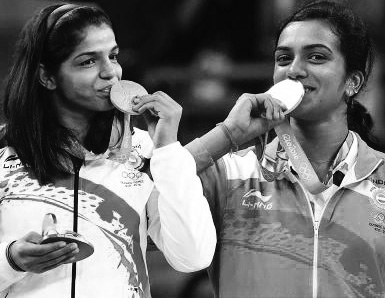 All the three became the first ever Indians in their sports to rank so high in the Olympics and all of them were taking part in the Games for the first time. These sportspersons made India proud in this Olympic Games by their sheer grit and determination. Sindhu’s remarkable display in Badminton where she defeated World No 2 Yihan Wang of China ( 22-20-21-19) and then All England champion and world number 6 Nozomi Okuhara ( 21-19,21-10) on her way to the final and then her titanic struggle against World Number 1 Carolina Marin before going down 21-19,12-21,15-21 in the clash for Gold, will be remembered for a long time to come. The 23-year old girl from Andhra Pradesh united the whole country as millions of people glued to their TV watched and prayed for her success. “I am proud of India, I am proud of the Olympic Silver medal” said Sindhu after the match and that summed it all. She became the first Indian woman to win a Olympic Silver, though three others had won it earlier- shooters Rajyawardhan Singh Rathore,Vijay Kumar and wrestler Sushil Kumar. Sindhu’s effort put India 57th on the medal tally table. Before Sindhu, wrestler Sakshi Malik captured the imagination of the people back home as she won the first medal for her country at Rio and enabled India to figure in the Medal tally table. Sakshi won a bronze in her category against all odds. She was trailing 0-5 with only two minutes to go but fought back with such ferocity that left her rival and Asian champion Aisuluu Tynybekova (Kyrgyzstan) stunned with disbelief. Sakshi garnered 8 points to become the first Indian women wrestler to win a medal- a bronze for India at Rio. “Medal is for my country. I am proud to have won the first medal here for India” she said after her medal winning bout at the Rio Olympics. It was no mean achievement Dipa and her coach Bishewshar Nandi had refused to train abroad after the Tripura girl qualified for the Olympics in this very city saying “ She qualified after training in India so what is the need of going abroad now” Others who missed the medal by a whisker included Beijing Games Gold medalist Abhinav Bindra. Bindra made it to the final of the 10 m Air Rifle but luck deserted him at a crucial moment and he was left with no medal. The reason for a high expectation from the Indian contingent was not misplaced. The Government had provided the sports persons who had qualified for the games, all the facilities and infra structure. They were allowed to go abroad for training and money was splurged on them. The qualification of 118 sports persons for the Games made it the largest ever Indian contingent for the Olympics. In London, India had sent 83 sportspersons to take part in the 13 disciplines and for the Rio Games, the number went up to 118 for 15 disciplines. India took part in Athletics, Archery, Badminton, Boxing, Golf, Gymnastics, Hockey (men and Women), Judo, Rowing Shooting, Swimming, Table Tennis, Tennis, Weightlifting and Wrestling. This time the numbers got bloated due to the inclusion of Women’s hockey team (16) and astonishing number of athletes 36,(19 men and 17 women) making the cut. For London only 14 (8 men and 6 women) had qualified for the track and field event. Also Golf was included in the Games and three Indians made the cut in this sport while Dipa Karmarkar became the first women gymnast to qualify. Before the Games the assessment made by the sports ministry and Sports Authority of India (SAI) which made huge investment in the preparations of the teams for the Olympics was that the country is likely to win over 10 medals. “But, going by form, we are expecting a double digit figure performance. Anything below that will be disappointing,” As the Games opened all eyes were on the highly expensive 12 -member shooting squad and it flopped miserably failing to win a single medal . In 2004 at the Athens Games shooter (now Hon: Minister of State, Information & Broadcasting) Rajyawardhan Singh Rathore had won a silver, and Abhinav Bindra took the sport to a new high winning a Gold at Beijing in 2008.. At London Vijay Kumar (Silver) and Gagan Narang had won a silver and bronze respectively. Before the Games, President of National Rifle Association of India (NRAI) Raninder Singh had asserted that shooter will perform much better this time ” Since 2004 Athens Olympics, Shooters are doing well in Olympic. In last three Olympics, we have one gold, two silvers and a bronze. I think this time we will do much better. But soon after the flop show, Raninder Singh said “I own the responsibility for this show. I know people back home are deeply disappointed that shooters are returning medal less. “We will look into the performance of the shooters and also our failure to win the medal. Hockey was another expensive team in this contingent and it also failed to live up to the expectations. After India finished runners up in the Champions Trophy for the first time in London prior to the Games, supporters and fans hoped that P.R.Sreejesh led team will have a podium finish after a gap 36 years but that was not to be. India started their men’s hockey campaign beating Ireland, but then went down to Germany, Holland, before beating ultimate winner Argentina, and then ended the league campaign with a draw with lowly Canada In the quarter finals, India lost to Belgium 1-3 and the dream of podium finish was shattered. Head coach Roelant Oltmans was ready with an explanation .According to him The energy level of Belgium was very high. We didn't bring in the quality that we brought in London (at the Champion s Trophy in June). For the boys there's was a lot of stress and pressure. Belgium took away the initiative and they deserved to win,"
"You have to see where we come from. We have the youngest team in the competition and for most of them this is their first kind of experience. You do need experience to win this level of game. "When it comes to quarter finals, it's a do or die match and that's where we need to improve. We are happy that the team could reach the quarter finals, but the team we have had the potential of going higher. It's bad for us and I am disappointed." He further added "We played with full pressure, but full pressure, I always say, is a kind of bluff. There are always gaps. Later in the game, we tried to put full pressure and even took out the goalkeeper," "We tried to close the gaps and tried a number of attacks, but in the third quarter we hardly saw any attacks at all. That's where we have been lacking,” The Women’s hockey team which had qualified after 36 years finished last in group B. It drew with Japan but lost the next four games on the trot to the USA, Australia, Britain and Argentina. Vikas in his fourth straight Olympic appearance, managed a best throw of 58.99m to finish 28th overall out of 34 competitors. He finished 16th in a field of 18 in the Group B qualification round. Gowda, who holds the national record of 66.28m, began with a 57.59m throw and improved by more than a metre for a 58.99m second throw before producing a 58.70m in his third and final attempt. "My performance was not very good today. It's frustrating. I've just had a lot of bad luck this year and a lot of injuries. I was not able to train until three or four weeks ago. Obviously, there was not enough time to prepare," Gowda said, "I tore both quad-tendons of my knees. I had to take a break from training so did not get enough time." Women shot-putter Manpreet Kaur, who holds the national record of 17.96m, finished 23rd among 35 competitors with a best throw of 17.06m. She came 13th in the Group B qualifying round. In the men's 800m race, Jinson Johnson failed to qualify for the semifinals after finishing fifth in his heat clocking 1:47.27secs. During the race, Johnson was hit on his legs by a fellow runner at the first bend and he struggled for a while before recovering and finished 25th out of 50 competitors. Johnson had clocked 1:45.98, the second fastest by an Indian after the legendary Sriram Singh, during the Indian Grand Prix in Bangalore last month. In the first round of the men's 400m event, Md Anas timed 45.95s to finish sixth in his heat and 31st overall, The top 3 performers in each heat, followed by the next three best performers advanced to the next round. In 800 Mts, Tintu Luka was no better she finished 29th over all. In the long jump qualifiers, Ankit Sharma started off with two fouls. He followed it up by a score of 7.67 in his third and final attempt to finish 24th overall. In tennis Paes and Bopanna in men’s and Sania Mirza and Prathrthana Thombare in women’s doubles made first round exit. While in mixed doubles Sania and Bopanna crashed out in semi finals. Four Table Tennis players, two weightlifters, two swimmers and a judoka. lived up to their reputation as they came and exited from their respective Olympic competition without creating any ripples.In rowing, Dattu Baban Bhokanal performed well within his limits. In Archery the women team did well to reach quarter finals but lost to Russia in the shootout. In the individual events they failed. In boxing, Shiva Thapa (54 kg) lost in his first round, Manoj Kumar (64 kg) in second round and Vikas Krishan (75 kg) in third round. Golfers SSP Chawrasia and Anirban Lahiri failed to make any impact on the depleted field. However India suffered a big blow two days before the close of the game when the Court of Arbitration for Sports (CAS) slapped a four- year ban on wrestler Narsingh Yadav. The CAS upheld the World Anti-Doping Agency's (WADA) appeal, which had questioned the clearance, and slapped a four-year suspension on Narsingh Yadav. The CAS further ruled that "all competitive results obtained by Narsingh from and including 25 June 2016 shall be disqualified, with all resulting consequences (including forfeiture of medals, points and prizes)."